I am interested in finding a good c++ library (or base code upon which to create one) to draw interactive connected graph components in Qt. By connected graph component, I mean graphs whose nodes are components with input and output sections in the style of graph nodes in Blender Node Editor or Grasshopper, see example. By interactive, I mean that I need to be able to access the component position and locations to let the user select and interact with them. My current implementation is using GraphViz with QGV but it only support simple component nodes (no specific input / output elements). While GraphViz supports record and html elements, QGV doesn't and it looks like a sufficient hassle to implement it within a fork of QGV correctly given the constraints from GraphViz that I wonder if there is no better choice, trying to not use GraphViz. I could also be fine with a simple non-graphics library that does the layout given size constraints and relative position constraints (the component blocks have a fixed size, the input/output nodes positions are fixed given the location of the component block). 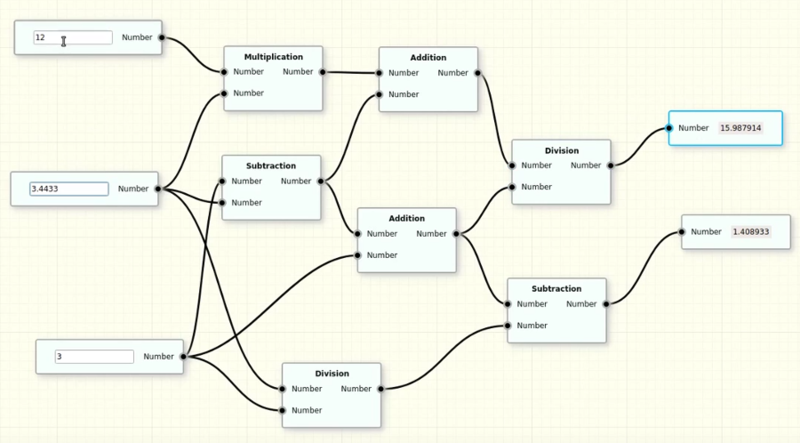 Maybe too late but still here is the library I develop for general-purpose node graph editing. Not the answer you're looking for? Browse other questions tagged library c++ data-visualization graphs component-diagram or ask your own question. Alternative for Graphviz with better automatic node placement for large graphs? Mind mapping tool that supports many parents OR task manager tool that supports many dependencies between tasks and also visualizing tasks as a graph?